Jan 17, 2018 NTel Pharma AREZ Mega-Update: When Two Gods Collide! What happens when Gods collide? 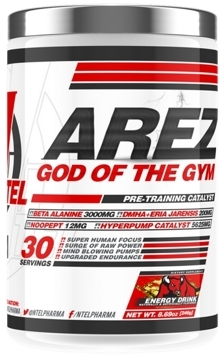 Combined from the popular Arez Black and Arez White pre workouts comes Arez God of the Gym! Also known as "Mega-AREZ", this is an epic combination of the two very popular pre workouts that put NTel Nutra on the map and established them as a big up and coming brand creating hard hitting products. Arez Black and Arez White are quite different pre workouts, one being a heavy hitter in energy and the other focusing on pumps and focus. AREZ God of the gym brings us the best of both worlds in one incredible pre workout that has a formula promising to make you a true God of your gym. God like energy followed up with mood enhancement, muscle pumps, zero crash and a unique mind to muscle connection if the promise that AREZ God of the Gym gives us. This is a pre workout that will give you a whole new perspective of pre workouts and is a "must have". Not only do you have caffeine for energy, Alpha GPC for focus, citrulline for pumps, but the addition of grains of paradise really makes AREZ God of the Gym a unique pre workout as grains of paradise is found in most fat burners because of its ability to increase calorie expenditure. Followed up with alpha yohimbine, AREZ God of the Gym will also lean you out and act as a fat burner by increasing thermogenesis and calorie expenditure. The addition of L-Dopa will also deliver mood enhancement which goes a long way to contributing to better performance. While the ingredients alone make AREZ God of the Gym stand out from other pre workouts, being backed up by amazing flavoring is a major bonus. NTel Nutra has formulated Arez to be one of the best tasting pre workouts on the market and comes in four delicious flavors: Sets on the Beach, Baja Blue Wave, Rainbow Sherbert, and Bomb Sick'll. Caffeine Anhydrous - Caffeine has many positive effects on the body. It stimulates the central nervous system, heart, muscles and acts as both an adenosine receptor antagonist and phosphodiesterase inhibitor. By blocking adenosine receptors, caffeine can increase the release of norepinephrine and dopamine. Caffeine decreases airway resistance and stimulates respiration. Some research shows that caffeine can even decrease GABA and serotonin signaling. Lotus Leaf Extract – A plant that aids in absorption and digestion will work with other ingredients to allow your body to absorb and make them more effective. Also promotes weight loss and cardiovascular health. Grains of Paradise Extract – Signals the body to use body fat as fuel. Will have a stimulant effect and also cause a greater calorie burn. Rauwolfia Vomitoria Exract - The strongest concentration stimulant we've ever used. Rauwolfia presents the utmost extreme in pre-workout stimulation, mood elevation, and increased metabolism. Velvet Bean Extract (L-Dopa) – Precursor of dopamine which is a neurotransmitter that promotes elevated mood and that "feel good" feeling. Chinese Skullcap – Reduces inflammation and is a calming agent. It helps with the stimulants in a pre workout to aid is maintaining level focus and thoughts. Hyper-Pump Catalyst – concisting of L-Citrulline, Beta-Alanine, Betaine Anhydrous, and Niacin all work together to promote blood flow and increase Nitric Oxide production and promote a more anabolic environment for those muscle splitting, vein enhancing pumps. Mind x Muscle Fusion Blend – Made up of Alpha GPC, Hordenine HCI, and Huperzine A. Hordenine is a natural MAO inhibitor, metabolism stimulant, and extreme focusing agent. This makes hordenine a stimulant of choice for Enhancing Mood, Increasing Strength, and boosting mind-muscle connection. Alpha GPC backs it up with even more mood enhancement properties.